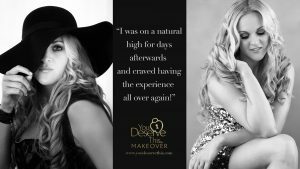 I was soooooo excited to be given a voucher for myself and one of my favourite people to attend a makeover and photoshoot with YouDeserveThis! I’ve followed Michelle and Charlie for a long time and been itching to have a photoshoot myself, so when the opportunity came up, I jumped at the chance!! Most of you probably know that I’m really not a girlie girl at all, I have my uniform that I wear almost all of the time and I’m very happy with this. 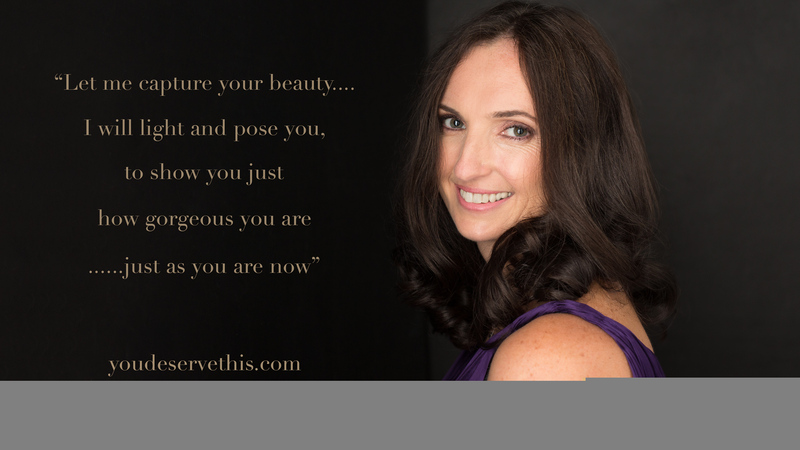 So being treated to a proper makeover AND a photoshoot was a huge indulgence. Being able to bring someone with me was even better as sharing the experience really made the day! One evening in October my bestie, Ali, and I went to have a look at the YouDeserveThis studio and talk through what we needed to prepare for our photoshoot. It was lovely to be able to meet Michelle and Charlie and to talk through how it would all work on the day. They really know how to provide the personal service and how to create an awesome customer experience. We talked about what we needed to bring with us on the day, what we needed to wear when we arrived and what clothes to bring with us, including underwear. We were advised to bring 3 or 4 changes of clothes for the photoshoot and to ensure that we varied the neckline of our dresses, to give some variety. This was pretty easy for me as I only have 5 dresses, they are all from Bravissimo and all are on the same theme! (perks of being large boobed and being allergic to polyester!). We were also advised to bring different colours of dresses and clothes, again to add variety so that our pictures weren’t all of the same colour and style. You can even bring dresses that don’t fit as it doesn’t matter as Michelle will peg or pin them for you at the back and ensure that you won’t be able to tell the difference from the front! I was HUGELY relieved that we didn’t have to bring shoes only dresses, appropriate undies and accessories. Michelle and Charlie have a very comprehensive style guide that we reviewed on the evening and then we were emailed a copy for our reference so we could refer back to the guide whilst we were getting everything ready for our photoshoot. Our initial session only took 45 minutes but it was definitely worth attending because being able to see everything in advance really took the pressure off. Over the next few weeks we had a few emails from Michelle and Charlie reminding us of what we needed to prepare and we also sent them pictures of the dresses we had chosen and the accessories we were planning to bring. It’s so sad that I was very pleased with myself when Michelle emailed me back to say that I had passed my homework with flying colours! Lol. Michelle and Charlie really believe in the personal service so if you are struggling with choosing clothes you can even arrange to visit the studio again with your clothes and have them help you, rather than doing this remotely. A few weeks later, on a Friday morning, Ali and I arrived at Michelle and Charlie’s laden down with all of our dresses, accessories and undies. We handed everything over to Michelle who hung everything up and laid everything out in the studio. Then it was Ali’s turn to have her make up and hair done. 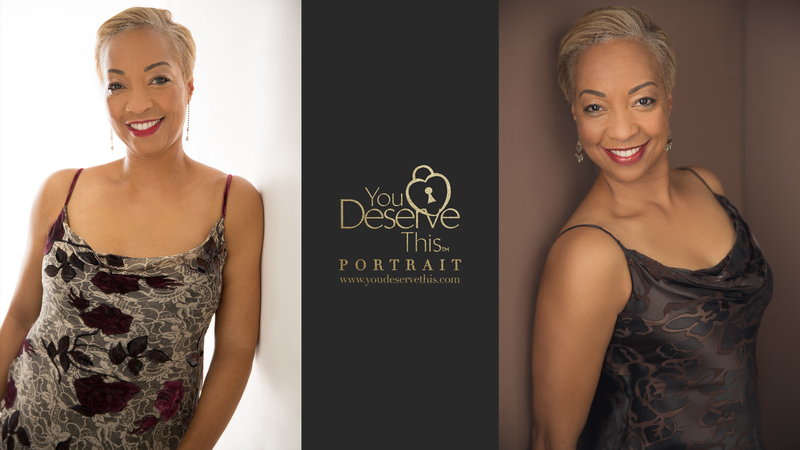 A lovely lady, Zoe, was our YouDeserveThis Makeup Artist and Hair Stylist and she did a fantastic job! I watched whilst Ali was having her make up and hair done and there was a lot of attention to detail. It’s a very relaxed affair, and the makeover area is very light and airy with music in the background. The whole effect makes you feel very relaxed. 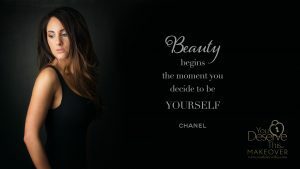 Michelle and Charlie are very particular about who they employ to be YouDeserveThis Makeup Artist’s and Stylist’s and Zoe is proof of this. She clearly knows what she’s doing! I’ve never had a makeover before, I didn’t even let anyone else do my makeup for me on my wedding day. 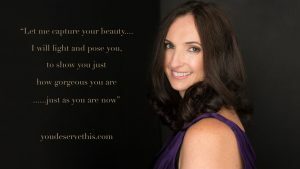 Having a professional makeover was very decadent and it was really strange seeing myself in the mirror when Zoe had finished as I looked far more glamorous than I’d ever expected! Lol. It really was a transformation and quite an emotional experience, which I really hadn’t expected. 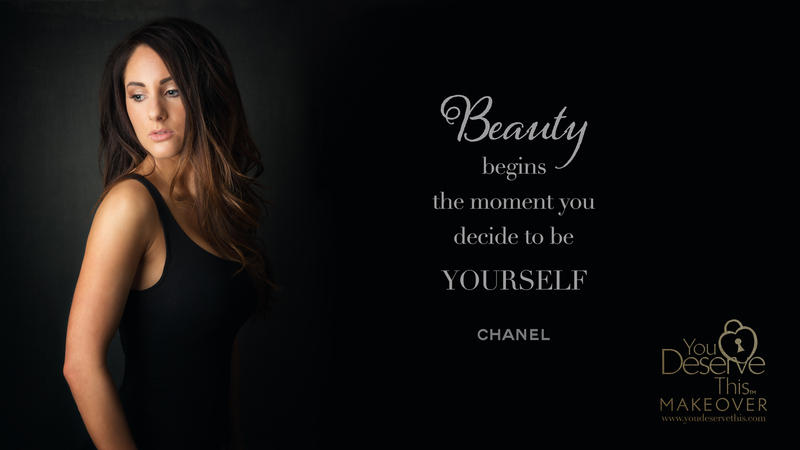 As Ali had her makeup and hair done first, she went into the studio to have some individual shots taken first whilst I had my makeover. Once I was ready we had some shots taken together and then some individual shots. It worked really well as it meant each person had time to get changed in the dressing room, whilst the other was having her pictures taken. It was also really fun to watch. The joy of having a photoshoot with someone you’ve known for over 25 years means that you can be quite honest and quite rude at the same time. We really had a giggle during our shoot and took the mickey out of each other quite a bit. I have to admit that I was a little nervous for the first 30 minutes but after I’d relaxed a bit I just got caught up in the whole thing and completely went with it. Charlie clearly knows what he’s doing and was very good at describing the different positions that we needed to be in. He had warned us at our initial session that we might ache a bit the following day as he would be putting us in different positions that may seem a bit unnatural but would look awesome for the camera. He advised us that he would be posing us specifically for women as he has been trained to highlight our best attributes. He also confirmed that all editing is “responsible editing”. I didn’t ache too much the following day but I could definitely tell that I’d been standing in a way that I wasn’t used too! I was really impressed that Michelle even laid on healthy finger food and she kept reminding us to eat and drink water as it’s important to keep hydrated and keep your energy up during the photoshoot. 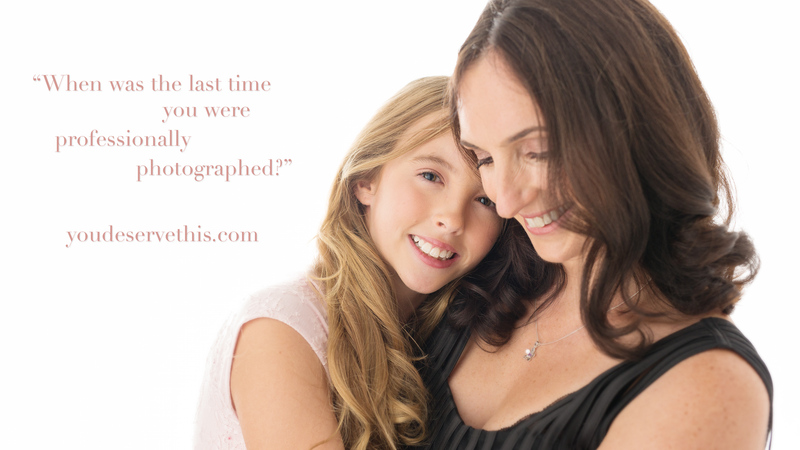 Our photo shoot took about four hours which sounds quite gruelling but the time just flew by! As the team only book one shoot a day, you know that you won’t be rushed and they block out 6 hours for each shoot. I love how Michelle changed the colours of the walls to change the look of each picture. Michelle and Charlie have set the studio up so that it’s really easy to change the colour of the walls from neutral to black, white, specialised grey or colours. I really love the pictures that they take with the natural backgrounds. I think they really set the pictures off and add a bit of glamour to each shot. There is a dressing room in the studio a TV system (if needed for toddler entertainment! ), a baby changing area and you can even bring your own play list if you would like as they also have a stereo system set up in the studio! They really have thought of everything that you would need and ensured that it’s a calm environment. I learnt that I would NOT be a very good fashion model! It was absolutely lovely and very decadent to be spoilt for the day but I have no idea how people do this every day for up to 14 hours a day! It’s not easy and I understand now why they are paid what they are paid! I also learnt how important it is to stand correctly and what to do to give my neck a slimline. I’m quite happy to admit that I’m a bit of a porker at the moment and so I have a double chin or two, but seeing the pictures on the camera of how slim my jaw looked, just by moving my neck and face in a certain way, was awesome! I’m soooo going to be doing the same thing for any Christmas pictures that are coming up! The photoshoots are designed for 2 people but they can accommodate several people in the studio so it would be perfect for a group of people, either as a baby shower, girls night out, antenatal group or a hen do experience. Michelle and Charlie can also do head shots for Business, for example LinkedIn pictures and they are also renowned for their baby photoshoots. Michelle is even known as “the baby whisperer” in several circles!! Michelle and Charlie really do make you feel like a princess/queen on the day. I’m REALLY looking forward to seeing the final pictures. I’ve heard a lot about the “reveal wall” and I’m excited about seeing what the pictures actually came out like! I would HIGHLY recommend this experience to all women, especially Mum’s who need a little bit of spoiling. I had forgotten what it’s like to dress up and be glamourous for the day, and even though Mr NHM said I looked “weird” when I got home with my make up on (doing the school run was interesting, and yes, we have had a discussion about what he should and should NOT say after I’ve been spoilt for a day!) I was on a high for the rest of the weekend. It was particularly awesome because I got to share the day with my bestie (it was part of her birthday present from me) and it was a really special experience that we got to share together. Even though I haven’t seen the final pictures, what I saw on the camera that Charlie showed us, I’m looking forward to being able to look back on the final pictures and remind myself that I was glamourous and gorgeous at least one day in my life! I can’t WAIT to see the final pictures and I hope that they are as good as I think they will be!!! Disclaimer: This post is a review of YouDeserveThis. My experience was supplied free of charge for the purposes of the review. I was not expected to write a positive review and any opinions expressed are my own.